“In the name and in the faith of Jesus Christ we place this stone and dedicate this building to the Glory of God” With this dedication Bishop Frank H. Juhan, of the Diocese of Florida, officiated the opening of St. Catherine’s Episcopal Chapel in 1951. The chapel began as a mission of St. Mark’s Church through the vision of the Rev. Douglas B. Leatherbury. The land was donated by Mrs. Kathleen R. Owens. 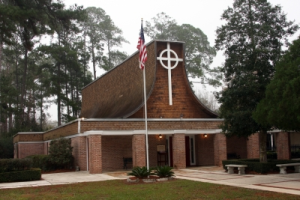 St. Marks provided the initial building, and with the support of the Diocese of the Florida, and 50 members of St. Mark’s, St. Catherine’s was on its way to becoming a dynamic presence in the Jacksonville spiritual community. The small mission quickly grew to a parish, under the ministry of Rev. Huntley Elebash in 1954. Rev. E. Jerome Zeller became priest, in 1957 and during his time with us the Parish Hall, educational building, and rectory were added. The Rev. John Libby was called to the parish in 1960, and under his direction the church we know today was constructed in 1965. The Jacksonville Journal called it “one of the most remarkable blends of modern, and traditional church design.” The 10 foot high modified Celtic Cross was constructed by Archie Markland a member of the church. The vertical loop symbolized the eternal love of God without beginning, or end. The horizontal loop was meant to be the church speaking to the world. The Rev. Charles H. Coit II came to St. Catherine’s in 1979. As Rector, Father Coit oversaw the addition of several stained glass windows in the sanctuary, and the modification of the right transept into the Chapel. In his spare time Father Coit counseled and joined in Holy Matrimony 46 couples – a record yet to be broken. The Rev. Richard Milner joined St. Catherine’s in 1987. Under his direction the Memorial Garden was established. His wife Salli-Ellen started a Clown Ministry. It was during Father Milner’s tenure that the main stained glass window over the altar was installed. In 1992 Rev. Ray Henderson arrived at St. Catherine’s. Under his leadership the Preschool was started. This rapidly grew, and new rooms were added. Rev. Nancy Suellau came to us as a Deacon, in 2007, and was ordained to the Priesthood that December. Under her direction the Parish Hall and Church office were refurbished, and the Food Pantry was enlarged. The Lord, our work, love and fellowship have sustained us in the past, and will continue to do so for the years to come.